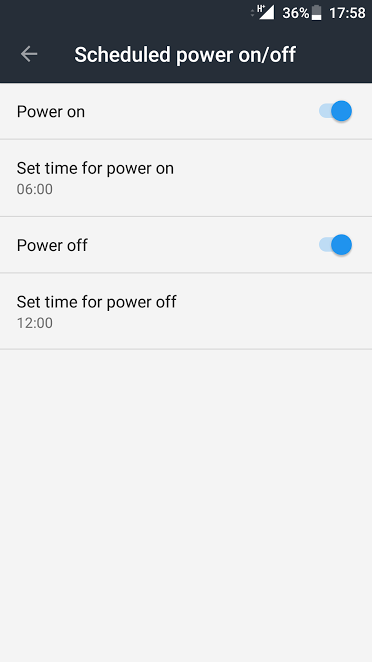 In android Nougat, scheduled power on and off feature has been given to shutdown the phone automatically on a fixed time daily. It turns itself on automatically again at another chosen time of the day. This is a Nifty feature for those users who don’t want to get annoyed by phone calls when they are sleeping. Or There may be a time period in a day when they don;t want the annoyance of phone. For example if you turn on this feature to daily shutdown the phone automatically at 12:00 PM at night and turn itself on automatically at 06:00 AM in the morning, this will save 6 hours of battery usage of phone also. So, here is how to do it. Step 2 – Go to Advanced. Step 4 – Now, toggle Both Power ON and Power off Button. Step 4 – Set time for Power Off and Power On. To disable this feature, similarly go to Settings -> Advanced -> Scheduled Power On / Off. Note that you must disable PIN Lock or finger lock to disable this feature.